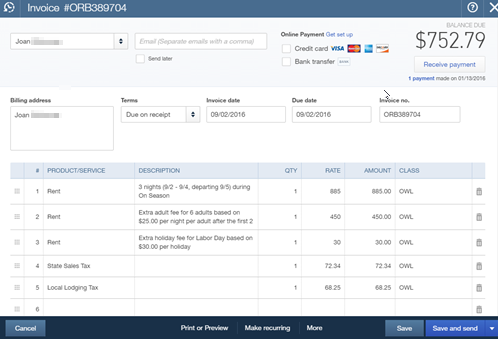 OwnerRez can now sync booking and payment records automatically with QuickBooks without you lifting a finger! If you use QuickBooks Online to manage your accounting, you'll want to set this up immediately. Go to Settings > QuickBooks to get started. 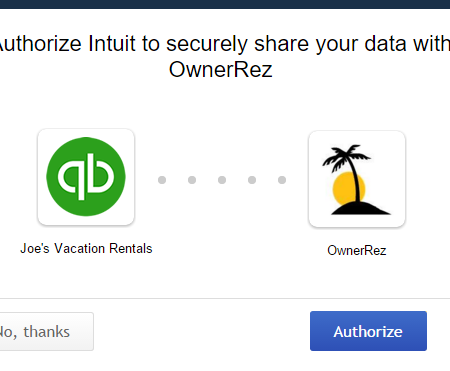 After you click the Connect button, you'll be redirected to Intuit's website where it will ask you to login, select your QuickBooks company (if you have more than one) and authorize OwnerRez to make changes. 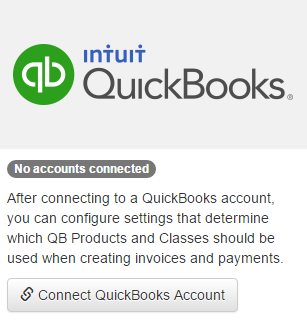 The process is dead simple, and if you're already logged into QuickBooks, you won't even have to type anything. Just a couple clicks. After you've clicked Authorize, you'll be redirected back to OwnerRez where we'll show you the authorized connection and present you with a page where you can map your charge line items, taxes and properties. Take a minute to read over the mapping options. The options allow you to specify how invoices and payments will be created on the QuickBooks side from your OwnerRez bookings. It's important that you get the mappings right. If you don't understand the mapping options, please contact us directly for help. Which bookings will be synced? Once QuickBooks is configured for a property, all bookings that are changed thereafter will start syncing with QuickBooks. Even changing the name or guest count on the booking will trigger a sync. To keep track of whether a booking has synced or is still pending, and to see the result of the sync, visit the QuickBooks tab under the booking. You can also manually trigger it to sync from the same page. If you have historical bookings that you want synced to QuickBooks, you'll need to manually trigger each one by visiting the booking > QuickBooks page and clicking the Sync Now button. If you have more than few bookings, let us know and we'll bulk update them all from our side. What exactly is synced with QuickBooks? When any bookings are created, updated or canceled in your OwnerRez account, our system will create corresponding updates in your QuickBooks account. Specifically, each OwnerRez booking is mapped to a single "invoice" in QuickBooks and payments are synced as well. 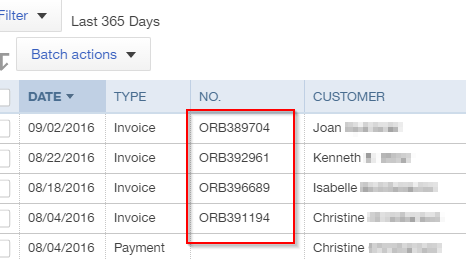 If you search QuickBooks with your OwnerRez booking number, you should find a corresponding invoice with the same number. That invoice will have the same payments in QuickBooks that you see in OwnerRez. What type of financial transactions are not included? For the moment, refunds and security deposit are not synced with QuickBooks, only payments are. This is because there are several ways "credits" can be recorded in QuickBooks and the way you do your accounting makes a difference. Security deposits, likewise, would create complications, so we've left them out too. We do not create "deposit" records in QuickBooks because there is no way for OwnerRez to know which payments settled together or if you deposited them at different times. You will need to manually record deposits on your own, though having OwnerRez payments automatically entered should make that process significantly easier. There are many ways of mapping data or displaying transactions. If you have a different way of doing things, and our sync isn't playing ball, please let us know so we can create options for you. Will we be able to integrate with the desktop version of quickbooks? Ok, that's a bummer, do you think you'll be trying to adapt it to the desktop after you get the online version done? Totally understand, thank you for putting that feature on the list! I was glad with the Online Quickbooks integration but when I tried to integrate OwnerRez told me that my Canadian version of QuickBooks isn't integrated yet. Hi Southern Florida, that's a great suggestion. I *believe* that it's just a matter of flipping on other countries, but I'll note that down in our dev roadmap to check into for you. It may require some additional testing and such on our side. If there's no major issues, we'll get that turned on for you. Its really nice information for accounting transaction. Thank you for sharing this information. It is useful information for us. Here, Our best support team are available anytime for solving accounting problems.